I was on a trip in New Mexico recently and visited this amazing bridge in the city of Taos, New Mexico. 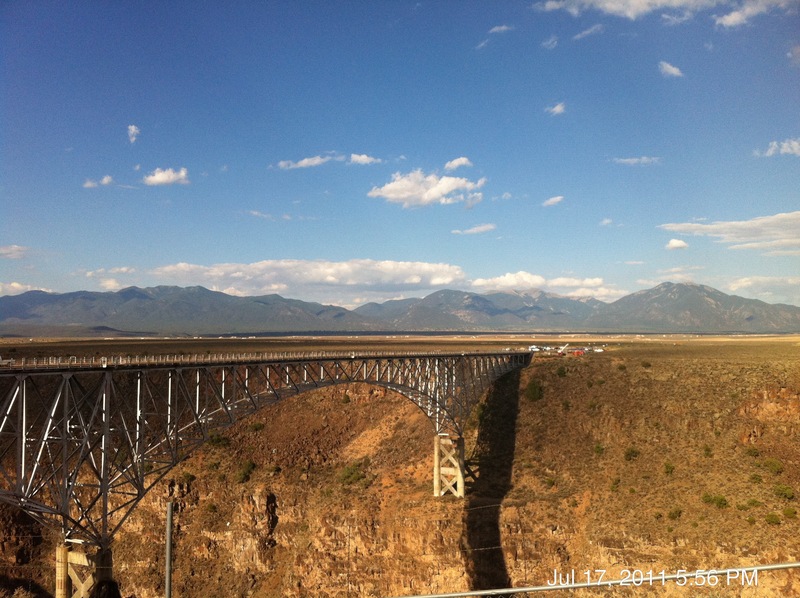 Rio Grande Gorge Bridge, if you are ever anywhere near this place you must absolutely see this. Pictures simply can’t do this bridge justice because…A. the size of the bridge and the gorge below it are so expansive it is impossible to get into one photograph and B. The beauty of this place is without question nothing compared to any photograph you could take. It is absolutely magnificent, decadent and magical. Oddly enough, when you approach this bridge you don’t realize that there is anything special about it until you are actually ON the bridge. You drive up to it and then you look down and it takes your breathe away….and before you know it you are on the other side. Bridges are structures that help us get from one side of something to the other without falling. In LIFE bridges are the support systems and processes that we use in order to help us cross to the other side. BUILD BRIDGES. Use love, compassion, communication, good nutrition, exercise, meditation, good friends, laughter and mindful living to build your bridge. Build Bridges.